Thank you for your letter of February 15, 1995. The Embassy, working with the Office of Defense Cooperation-Turkey, has determined the fate of the USS Norris. 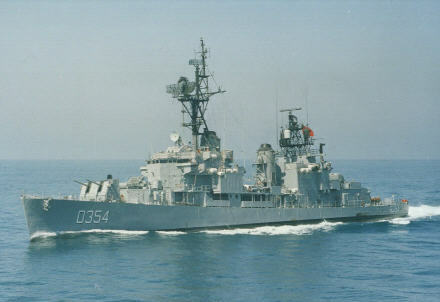 In 1974, the USS Norris was transferred to the Turkish Navy as "spare parts," to be used by the Turkish Navy to provide replacements for the other ships of her class which were transferred at the same time. Shortly thereafter, the Turkish Navy, realizing the excellent material condition of the Norris, returned the Norris to service in the Turkish Navy. Twenty years later, The Norris, renamed the TCG Kocatepe, was decommissioned (June 1994) and was sold by the Government of Turkey to HAS (Hurdasan Anonim Sirketi), a subsidiary private company of the state-operated MKEK (Makina Kimya Endustri Kurumu), for scrap. My staff has confirmed this final disposition of the Norris/Kocatepe with HAS officials. The Norris/Kocatepe had completed fifty years of service in the navies of the United States and Turkey when she was decommissioned for the final time, an honorable record by any standard. FRAM II. Ex-DDE. Was originally transferred to Turkey for cannibalization and scrapping. When Turkish Air Force accidentally sank the KOCATEPE (D-354), with the loss of 80 sailors, [ex-USS HARWOOD (DD-861)], during invasion of Cyprus in July 1974. Permission was obtained to activate the NORRIS as replacement.She was commissioned into the Turkish Navy on 7-24-75 as KOCATEPE (DD-354). Scrapped in 1993. My dad, Gurbuz Ozcan, served as commander of Kocatepe in the early 80s. I was 12-13 back then but remember spending some time onboard when it was at port in Golcuk. My dad passed away in 2000. He retired from the Turkish Navy in 1994 with the rank of Captain. Too bad that the ship was scrapped at the end.